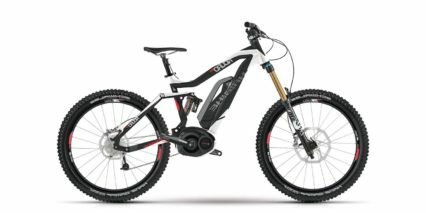 FSA, Integrated, Threadless Internal Cups, Sealed Cartridge Bearing, Tapered 1-1/8" to 1-1/4"
The Haibike XDURO AllMtn 8.0 is a full suspension enduro class electric bike that offers a balance of climbing and descending performance. 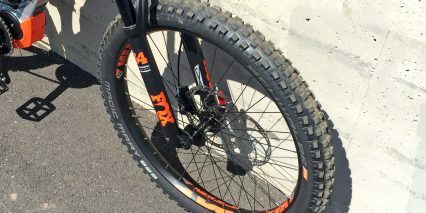 With longer-travel 150 mm Fox air suspension and 2.8″ plus sized tires, the bike is comfortable and stable. 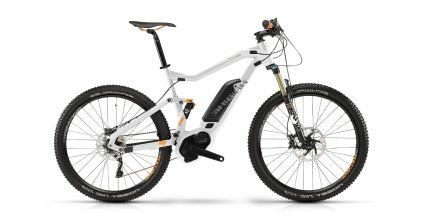 The iconic angular tubing and sporty color scheme (that flows through the rims, shocks and battery stickers, and saddle accents) minimize the visual footprint of the motorized bottom bracket and black battery pack. The Yamaha motor is smaller and lighter than many competing products of this generation, further streamlining the look and raising ground clearance. Large screwed-in plastic grommets cover the internal routing ports and make servicing easier. 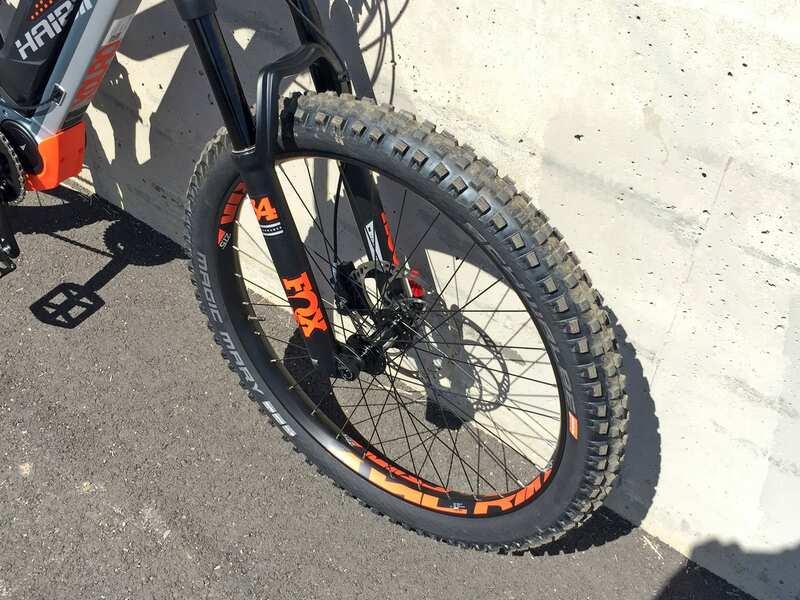 Both wheels feature quick release with sturdy thru axles, 15 mm front and 12 mm rear, with wider Boost hub spacing for strong spoke bracing angles that support the beefier tires. 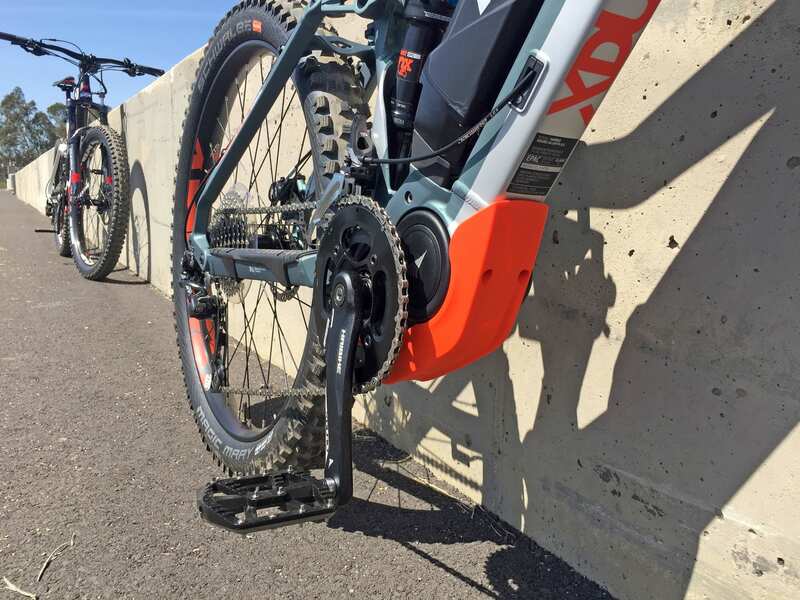 Whether you get the AllMtn 6.0, 8.0, or 10.0, the drivetrain offers expanded 22-gear combinations in a 2x setup. 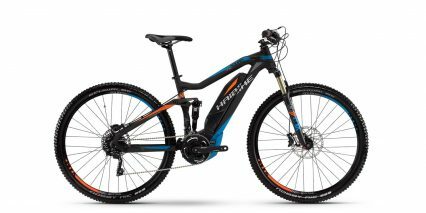 It seems like the mountain bike industry, and eMTB especially, have moved towards 1x drivetrains to reduce weight and complexity. Having motor support on-demand means that it’s okay to have larger steps between cogs. 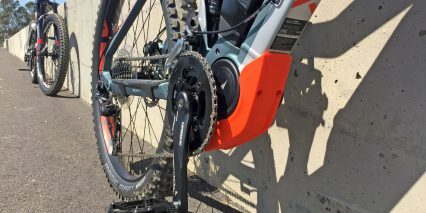 With 12-speed 10-50 tooth cassettes now available, multiple chainrings aren’t nearly as critical. 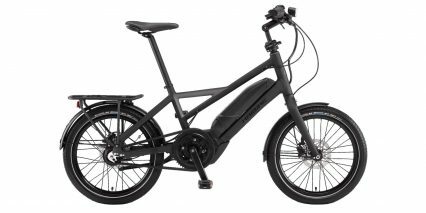 Still, the Yamaha PW-X mid-drive is one of the few motors that are even capable of supporting it, and they do a great job here. 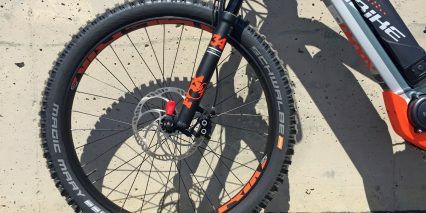 The two front chain rings are 32 and 44 tooth with the rear cassette offering 11-40 tooth and a Shimano Deore XT derailleur with one way clutch (or standard Deore still with one-way clutch on the 6.0). 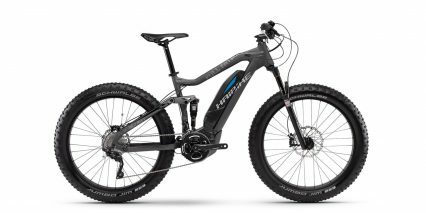 All three models utilize the same motor and battery pack, the biggest trade-offs are in suspension, saddles, brakes, and tires. 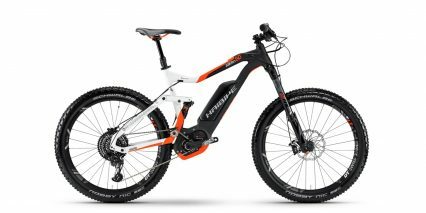 I’m focusing on the AllMtn 8.0 because it delivers a sweet spot of price and performance… and I prefer Fox shocks over SR Suntour in terms of performance, aesthetics, and brand recognition. One big gripe with the 6.0 and 8.0 is the Selle Royal saddles which are too curved for my seat bones. 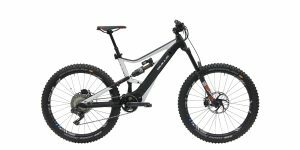 I much prefer the Prologo saddle on the 10.0 and would definitely swap the others for an Ergon, based on my own body geometry. 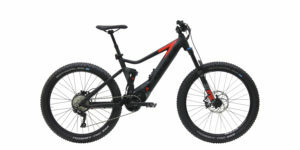 I love that Haibike offers so many frame sizes, four for the 8.0, and has such a vast global network of dealers. 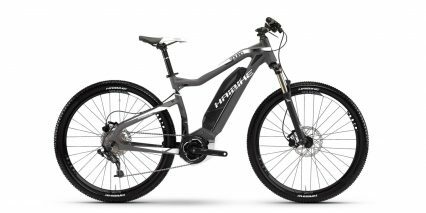 I was told that Haibike is the world’s largest electric mountain bike specific manufacturer, and they are headquartered in Germany. I’ve reviewed many Haibike models over the years and discovered that sizing and general availability can be spotty because the line is so vast, especially late in the season. It’s best to work with a local shop and test ride whatever they’ve got on hand before ordering the specific model level and size. This can take additional time but is well worth the hassle for such a premium product, especially when the shop will assemble and fit it for you. 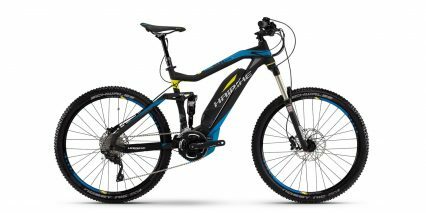 Haibike offers an excellent two-year comprehensive warranty, is backed by the Accell Group, and has longstanding working relationships with leading drive system manufacturers such as Yamaha and Bosch. Driving this bike is performance specced mid-drive motor from Yamaha called the PW-X. 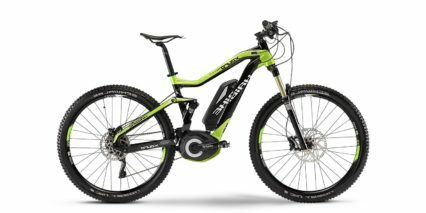 It delivers 250 to 500 watts of power with peak torque output of 80 Newton meters. This puts it slightly above the current-generation Bosch Performance Line CX. 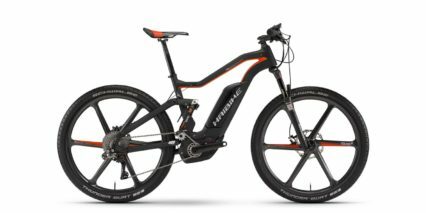 It’s also lighter, more compact, and more efficient to pedal unpowered or beyond the 20 mph top assisted speed because there’s no reduction gearing… it utilizes standard chainrings. 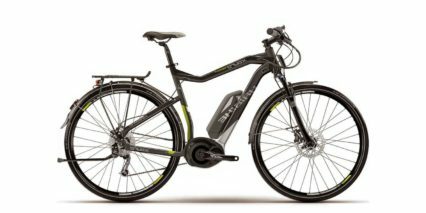 This is a Class 1 drive system, meaning that it only delivers support when activated by pedaling and tops out at 20 mph (32 km/h in European markets). 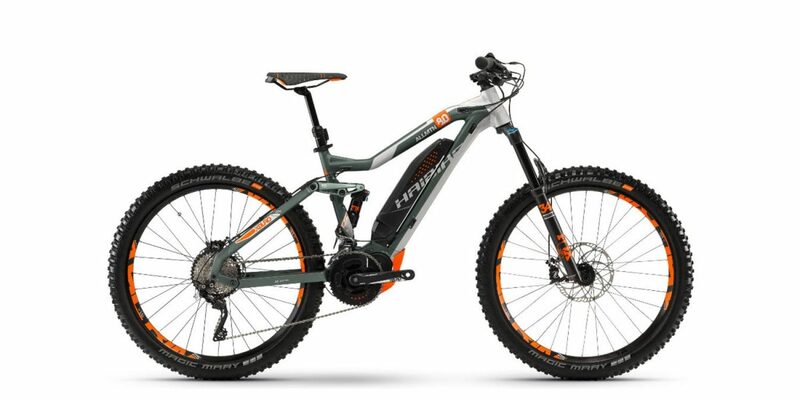 As a Class 1 electric mountain bike, the Haibike XDURO AllMtn 8.0 is allowable on the highest number of trails in the USA and is treated like a bicycle under federal legislation. 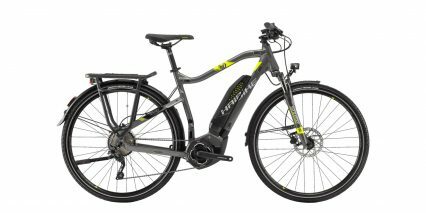 Compared to the city-oriented Yamaha PWseries motor, the PW-X produces more noise and uses energy quicker in the highest levels of assist, specifically EXPW (extra power mode), but is actually 13% smaller by volume (shorter and narrower) with a Q Factor of just 160 mm. For plus sized models like the All Mountain series from Haibike, I believe the effective Q-Factor is wider so you don’t end up with heel strikes on the chain stays when pedaling. This motor offers a maximum assistance of 320% based on rider input, responds to rear wheel speed, pedal cadence, and pedal torque (relying heavily on torque), and can run up to 120 RPM for faster pedaling. 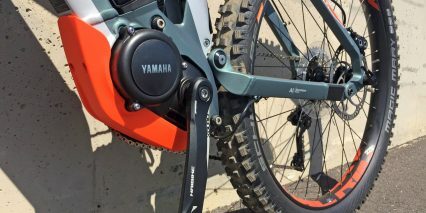 This last point is a big one for me personally as I prefer to downshift when going into hills and found that the standard PWseries motor would not be able to keep up with its limited 100 RPM pedal rotation support. 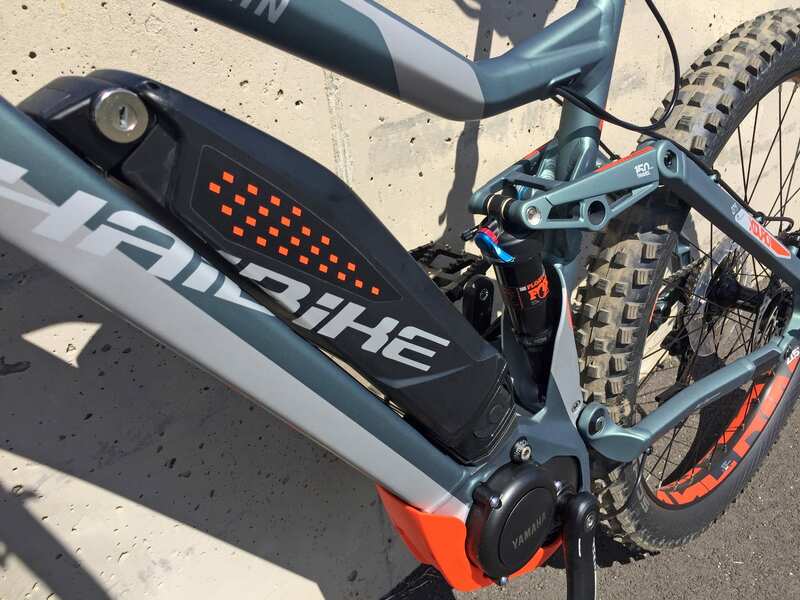 With all of that speed and the additional gears, it’s worth noting that there is no shift detection built into the motor controller, so you’ll reduce mashing and drivetrain wear by easing back on pedal torque just before and during shifts. The spindle uses ISIS vs. square tapered for stronger grab and durability and the internal gearing of the motor now features four pawls and 24 teeth vs. two pawls and 16 teeth on the PWseries. Basically, the motor can engage faster! I’ve just recited a lot of stats for you but the big takeaways compared to Bosch CX, Shimano E8000, and Brose S, for me have been that this motor is compact, efficient, and powerful, but louder and less capable at the 120 RPM pedal rate despite the big upgrade from the PWseries. It’s still the value offering for Haibike models with Bosch CX leading in performance. 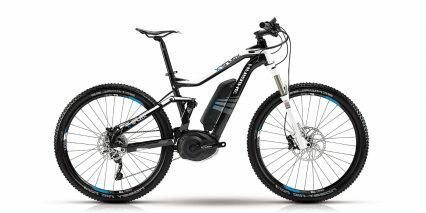 Powering this ebike is a 489.6 watt hour Lithium-ion battery pack called the Yamaha X0R-10. 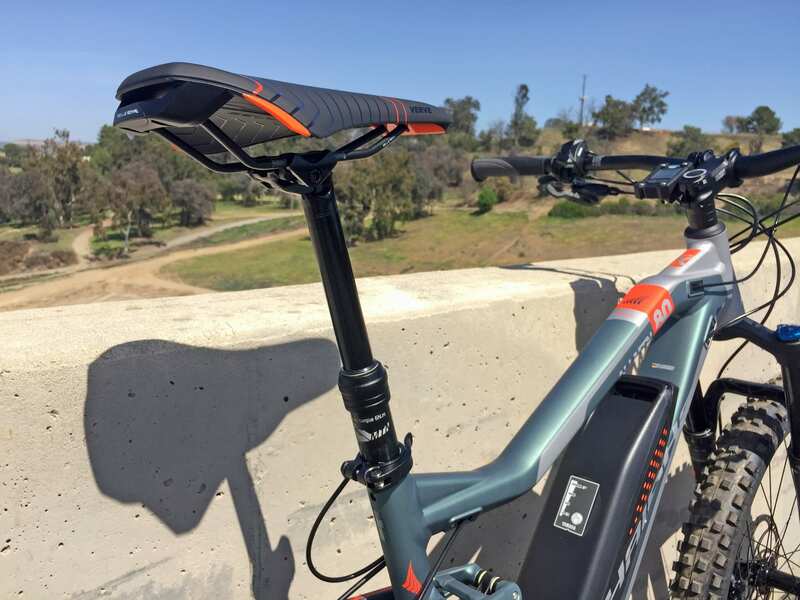 It’s externally mounted to the downtube, flatter and longer than many competing products, and it mounts in from the left side of the frame. 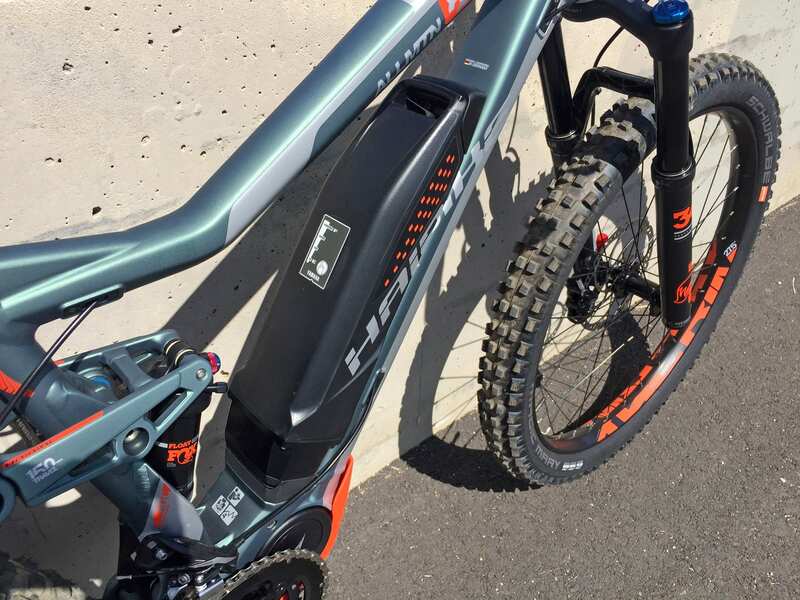 This side-mount design reduces the potential for contact between the top of the battery and the top tube of bike frames and allows the top to be to be lower and more angled, as is the case here. 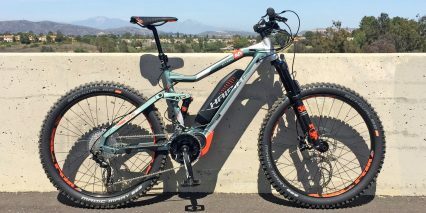 Ultimately, the bike frame can be easier to mount and more comfortable to stand-over with a lower or sloped top tube and that can make a big difference if you’re riding off-road and step down on an angled slope. 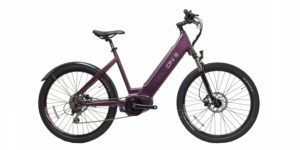 There’s a lot to like about the Yamaha battery packs… the casing for the 400 and 500 watt hour packs is the same, so it’s backwards compatible if you own a second e-bike with the smaller pack. There’s a sturdy, and wide, plastic loop at the top for secure mounting and transport. 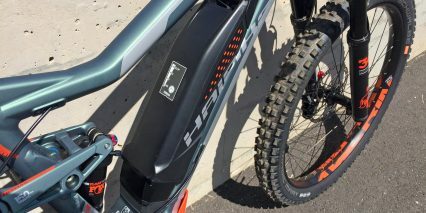 There’s a sealed LED battery indicator built in to the top of the battery casing, so you can estimate how full it is without mounting to the bike or turning the bike on. And, the locking cylinder design seems sturdy. 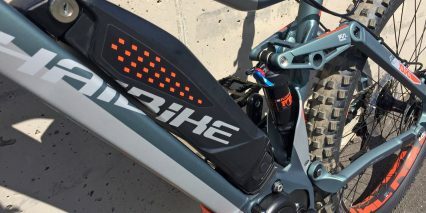 I like how it’s positioned up high on the mounting interface to reduce debris and dust exposure while riding. This is where some of the trade-offs and design compromises start to arise. 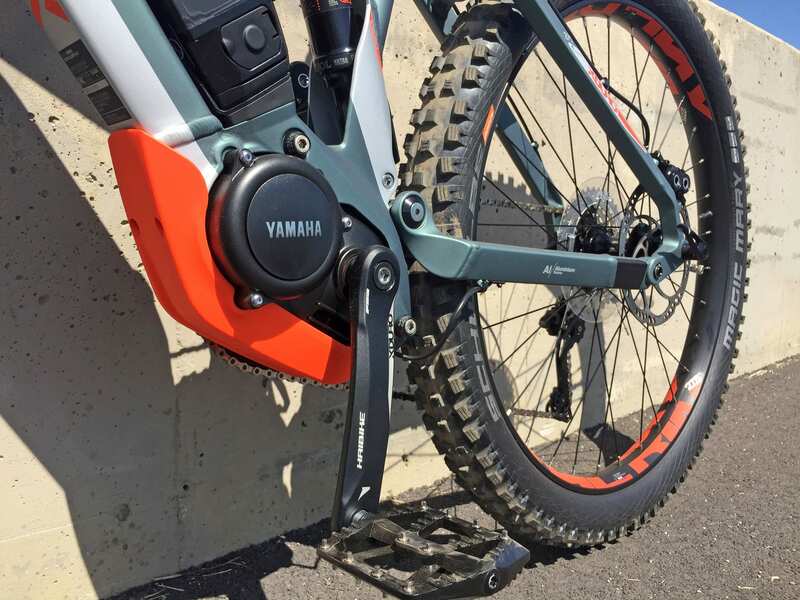 I think that the battery should have been designed to mount in from the right side of the bike because most mountain bikes don’t have kickstands and it’s a best practice to lay them down on the left to protect the drivetrain and derailleurs on the right. 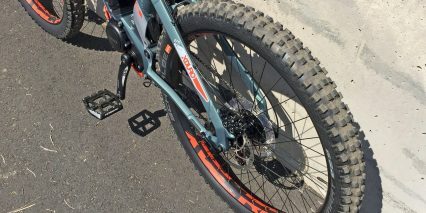 Disc brakes are still delicate, especially larger ones like the 203 mm front rotor here, so do be careful. I personally think that the keyed slot and mounting side should have been on the right so that the bike could be laid down when removing the pack and perhaps then the charging interface could have been moved up on the left side. 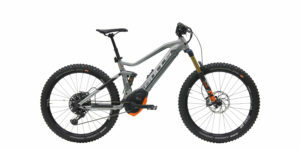 As it is currently designed, the charging interface is low on the left, directly in the path of the left crank arm. This creates a point of vulnerability because the charging plug design is relatively thin and seemingly delicate in hard plastic. Compared to Bosch, which uses a wider rubberized plug, I’m always concerned about stepping on this charger tip and I definitely do not appreciate how long, bulky, and heavy it is… weighing in at 2.2 lbs (0.99 kg) compared to Bosch at 1.6 lbs (0.72 kg). 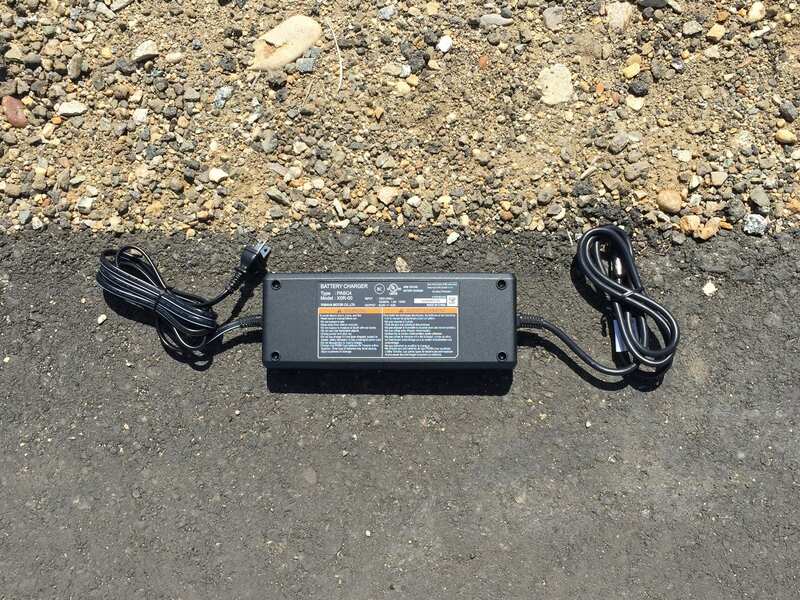 The fast four-amp output is much appreciated, but this charger is one of the bulkiest on the market at this time and I haven’t seen a portable option from Yamah, as I have from Bosch and Brose with some Specialized models. In conclusion, this battery pack is great in many ways but definitely has some room for improvement. It’s best to store any Lithium-ion battery in a cool, dry location, and avoid dropping and discharging below 20% to maximize stability and lifespan. 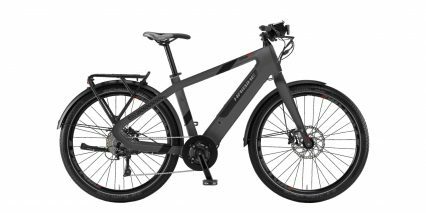 In my opinion, Yamaha has been a leader in display and control pad design for electric bicycles since their products began showing up in North America around 2016. Two particular older models come to mind: a large removable LCD unit with remote button pad that was easy to read but somewhat vulnerable to impact (mounted high atop the handlebar, near the center), and a more compact fixed LED unit with limited readouts and integrated buttons (mounted atop the handlebar, near the left grip). The LED control pad was usually included on value-priced models because it didn’t include as many sub-menus and didn’t offer Micro-USB charging. 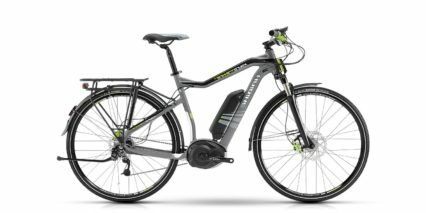 For the new PW-X powered electric bikes, Yamaha has drawn on both of these early control interface designs to create a durable but feature rich offering that maintains the Micro-USB port. I love that they kept this interface because it can be useful if you use a smartphone for GPS navigation, Strava, or music, as well as diagnostics and software updates. 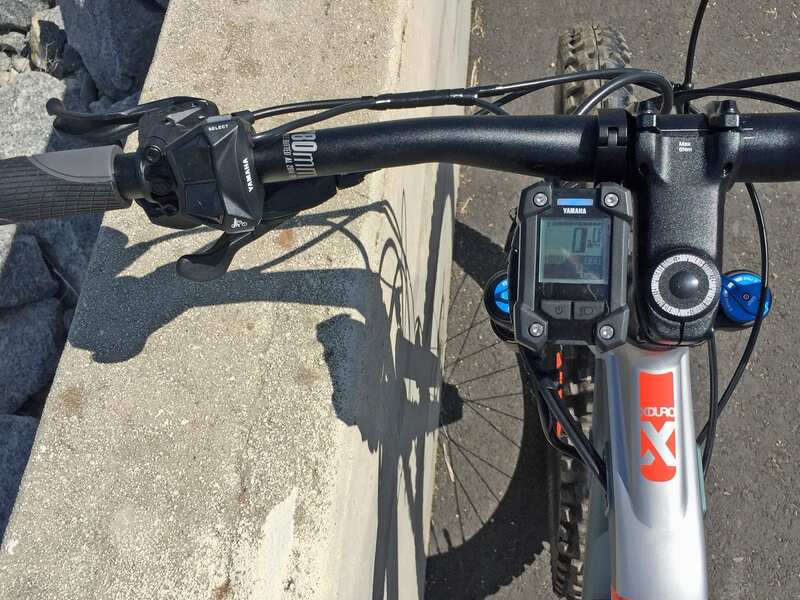 The PW-X user interface consists of a compact LCD screen, positionable on either side of the stem, and a remote button pad, usually attached near the left grip. 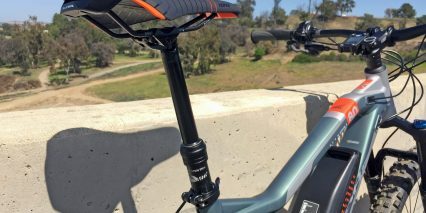 Despite the second set of shifters on this bike, the button pad was still very reachable for me during the test rides of the XDURO AllMtn models. Buttons include a rubberized power button and light button on the display console along with plastic select, up, down, and walk mode buttons on the control pad. 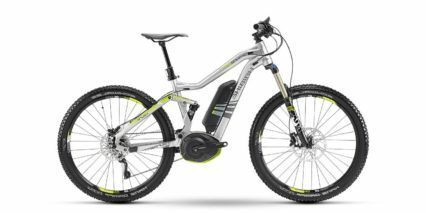 Unfortunately, it seems that Yamaha or Haibike may have disabled walk mode for the US market, as it did not work on the stock bikes I tested. 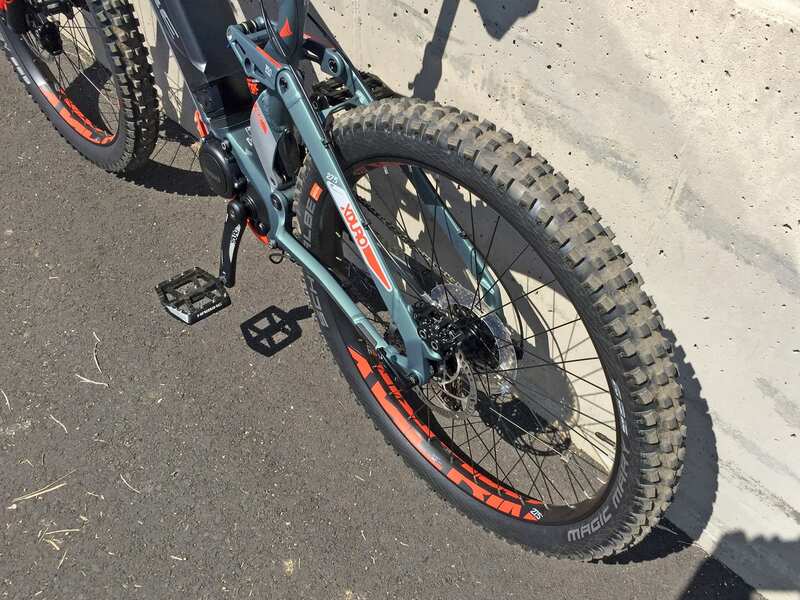 That’s a bummer when you need to walk a technical section of trail or wind up with a flat tire. Once the display is turned on, the most basic interactions are to arrow up and down through Off, +ECO, ECO, STD, HIGH, and EXPW. 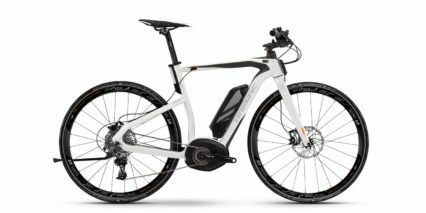 Select allows you to navigate through different sub menus including odometer, trip meter, average speed, maximum speed, distance (range estimator), pedal cadence, time, and battery percentage. 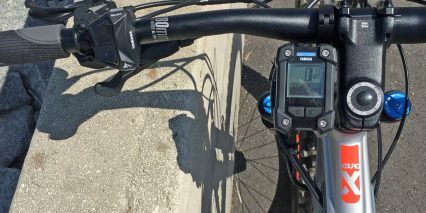 It was neat being able to test my pedal cadence on the fly, I really appreciate the range estimate to help gauge when to switch down assist levels in order to make it home without running out of power, and the 10-bar battery infographic and battery percentage drive this point even further. You can enable Bluetooth, disable the USB port, and even remove menus from that long list by holding the select button to get into a settings menu. And, there’s one final treat with this display. In addition to the blue-backlit LCD screen, there’s a colored light strip that matches up to the different assist levels. I think the idea here is to make it easy to glance down and know what level of assistance is enabled. It’s a great concept because the LCD itself is on the small side… but in practice, I found the LED readout to be difficult to make out in bright daylight. At night and in the woods it probably works great, and might even be distracting. And so, it’s also nice that you can completely disable the LED light strip back in the settings menu. All in all, this display does an excellent job. 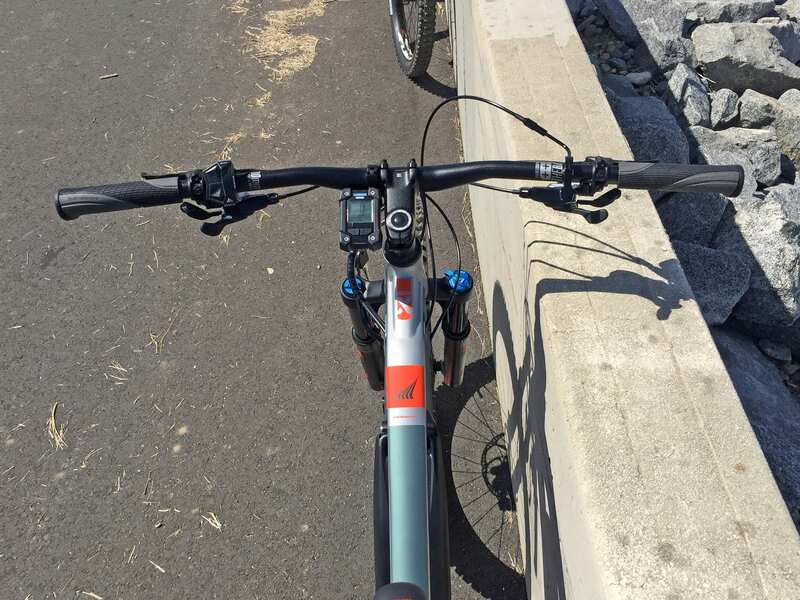 It mostly stays out of the way and is easy to interact with while pedaling, even without looking down because of the sloped clicky control pad design. It is not removable and cannot be swiveled to reduce glare, but the large plastic bezel looks tough and seems well protected inline with the stem. 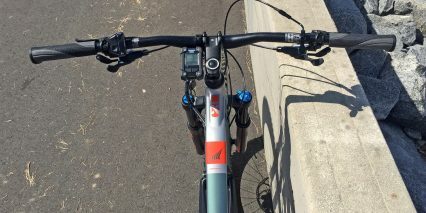 I love how clean and open the handlebar is, allowing plenty of room to attach a phone or light. 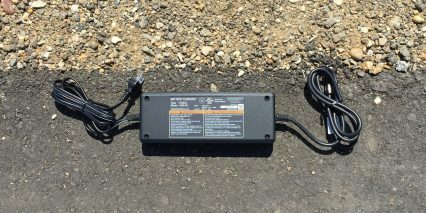 Note that the light button could become active for this display if you work with a shop to wire in aftermarket lights. I filmed this review with the help of a younger and older rider (Matt and Steve – who is 64 years old), at the Brea Dam in Fullerton California. 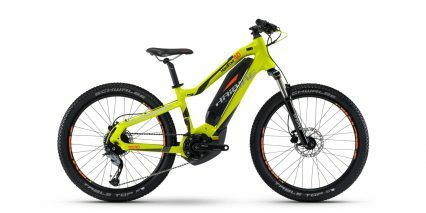 They both work at the Electric Bicycle Center, which has been a leading Haibike and Accell ebike dealer for many years. It was really cool to get their insights and show the differences between the 6.0, 8.0, and 10.0 back to back. 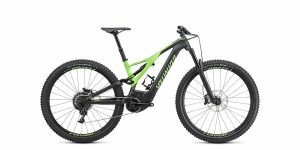 I hope this review covers the main concepts and shared-details well enough to help you make a decision or go in for a test ride. 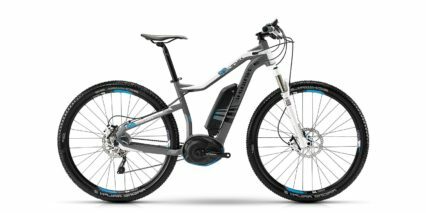 Haibike does sell similar All Mountain models with the Bosch drive system, but they only offer the 1x drivetrain with 10 or 11 gears vs. 22 gears here. 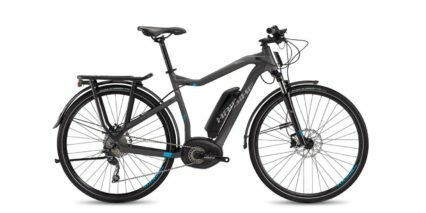 This particular model, the Haibike XDURO AllMtn 8.0, won the 2018 Interbike Innovation of the Year award. 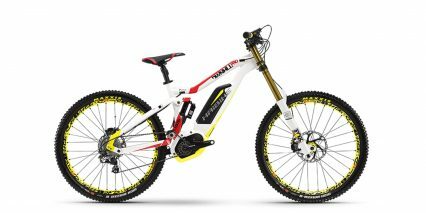 If you pay more for the 10.0 model you’ll get gold colored Kashima coated stanchions, lighter Magural MT7 hydraulic disc brake levers with tool-free reach adjust (vs. MT5 here), and that comfy Prologo saddle. I want to call out the quad piston calipers on the 8.0 and 10.0 which spread out braking force. 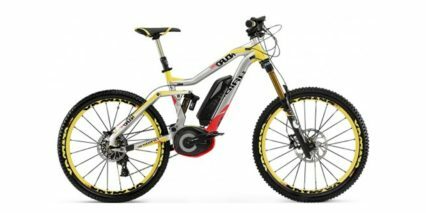 The larger 203 mm front rotor and 180 mm back rotor which provide mechanical advantage and improved cooling. 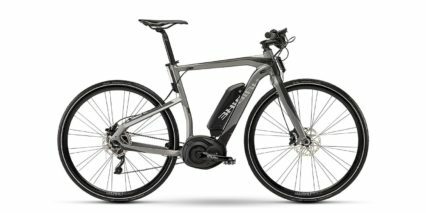 I really liked the SLX front derailleur design on both bikes, how it’s swept back and really tucked in to minimize pant leg contact. 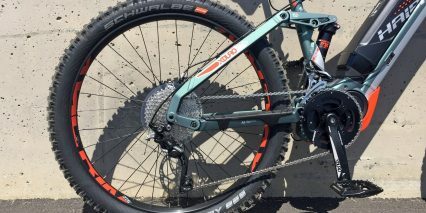 The front derailleur acts as a chain guide and pairs nicely with the one-way clutch on the rear derailleur. 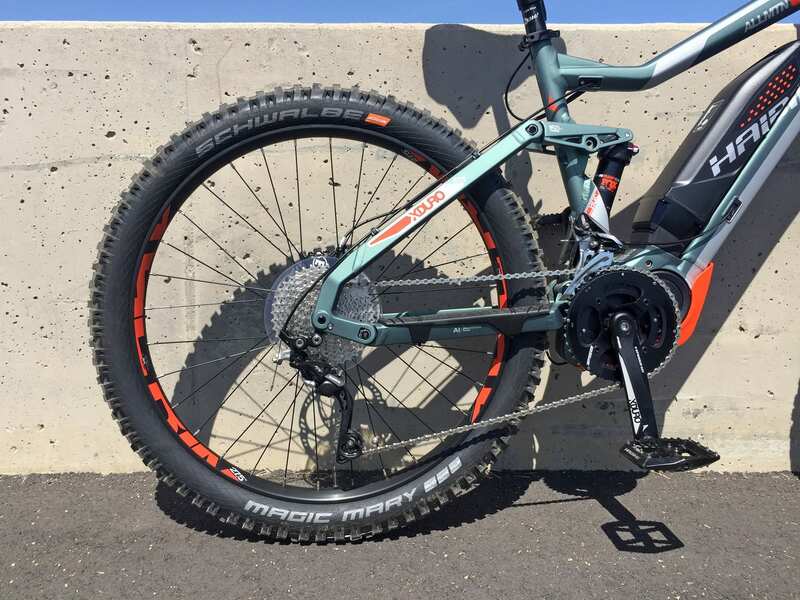 The Schwalbe Magic Mary tires provide great traction with big knobs, comfort and float because of the increased air volume, and reduced deflection on large rocky sections. 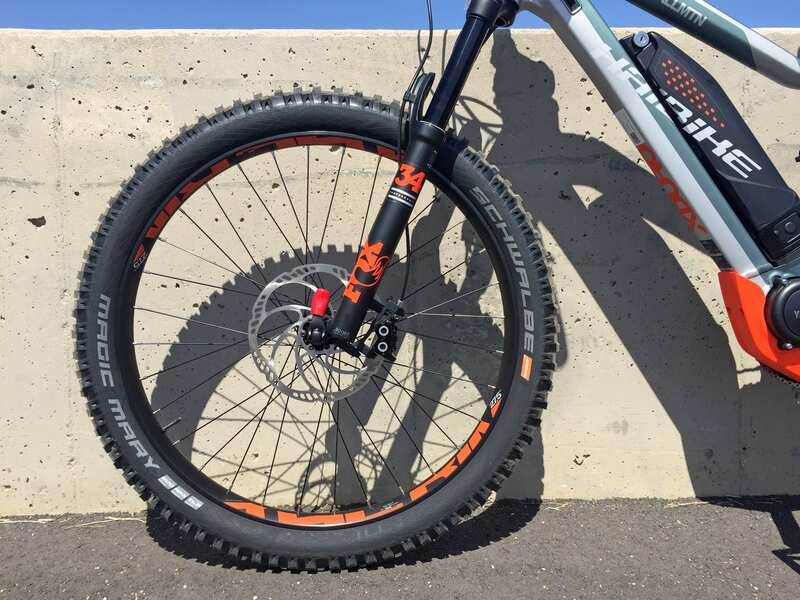 They were designed with tougher sidewalls for reduced punctures and cracking (especially if you run at low pressures) and come tubeless ready for easy conversion. 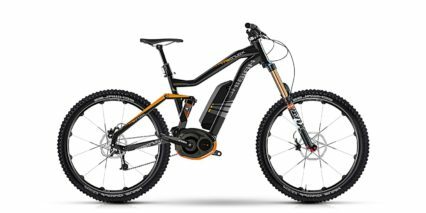 Matt explained that he appreciates the extra weight of electric bikes that keep you feeling planted, and that the centered motor and battery here make the ride feel balanced… but that they are more difficult to bunny hop and handle on jumps. 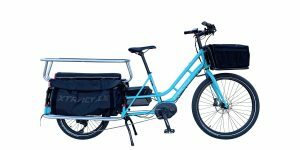 This is a ~52 lb (23.5 kg) electric bike, but it comes with all the fixins like dropper post, locking grips, long rubber slap guard, adjustable front axle mount, plastic motor skid plate, and nice large pedals with metal pins. It’s a ton of fun to ride and I think it looks beautiful. 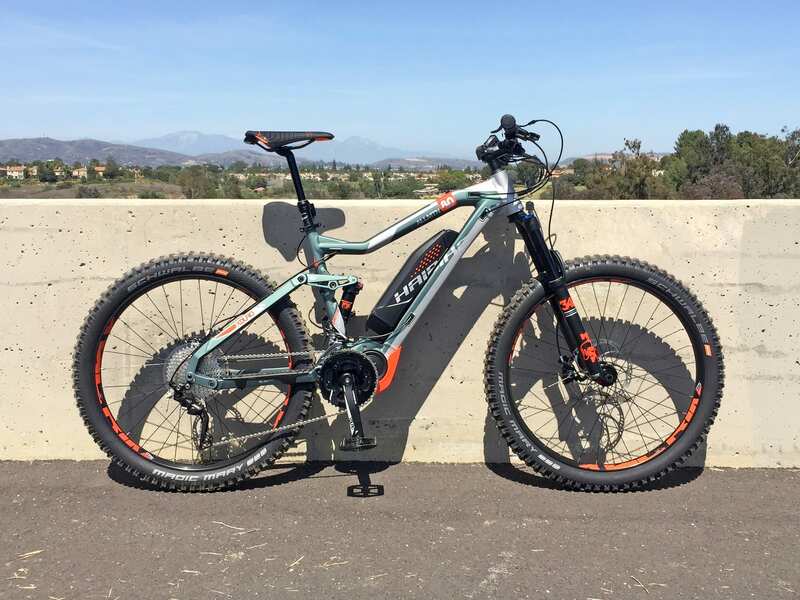 Note that I was test riding a size large frame for this review (at least the 8.0 was large). 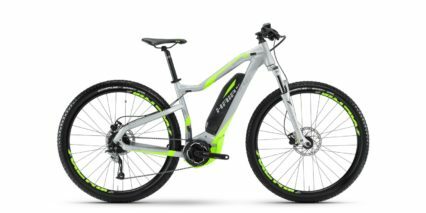 Big thanks to the Electric Bicycle Center for partnering with me for this review and sharing their time and bikes to make it possible. 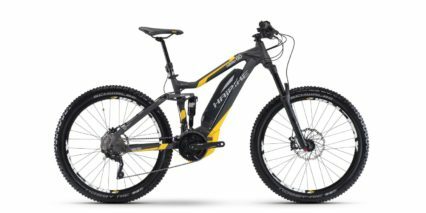 I welcome your questions and comments below and invite you to connect in the Haibike forums. Love your reviews! A thought that came to mind while reading was is there a way for you to prioirtize the best bikes of the year upfront to review for the year? 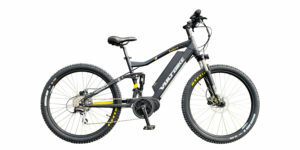 This bike is completely sold out in many sizes and unavailable from the manufacturer.